Say what you will about X-MEN ORIGINS: WOLVERINE; Hugh Jackman did what he does in every role he accepts. The most. The best. And next summer he’ll deliver us the movie he wanted to make the first time. Titled THE WOLVERINE and currently filming in Australia and Japan under director James Mangold, the new installment will finally find Logan face to face (and claw to katana) with the Silver Samurai (Will Yun Lee) over his love for the Samurai’s half-sister, Mariko Yashida (Tao Okamato). Not surprisingly, Jackman looks fantastic. Before original director Darren Aronofsky departed the project early last year, he told Jackman to get bigger than ever. And Jackman did, eating 6,000 calories a day and bulking up to 210 pounds of muscle. But then the film was delayed and Jackman had to lose the extra size for other roles, leaving fans wondering what if he’d go that big again. Personally, I think the leaner frame works a lot better for a film that has Japanese roots and will undoubtedly feature lots of fighting and martial arts. 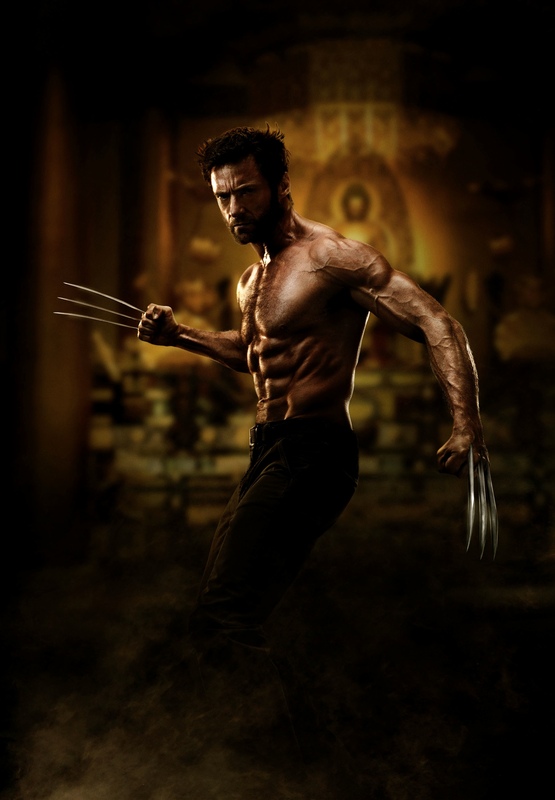 I can’t even imagine the kind of physical and emotional dedication it would take to attain and especially maintain that kind of shape, and it’s awesome to see that Jackman’s still willing to give everything he’s got to the fans of the character who made him famous. I’m outrageously excited about this movie and expect it to surprise a lot of people when it slices its way into the theater near you on July 26, 2013! I really prefer the smaller, leaner, “scrappier” look too; It’s more how I picture a guy who’s called “Wolverine”. And good gravy, I’m SO relieved they finally figured out a way to make his hair work in live-action that doesn’t look totally ridiculous. Next year is gonna be the bee’s knees for superhero pictures! It’s going to be an awesome year for sure, Alex! Iron Man, Wolverine, Thor, Superman. Am I leaving something out? Well said about the hair. This is the best Jackman has ever looked in the role. I hope I look that good when I’m pushing 45. Hell, I don’t look that good now! I’d throw RoboCop on that list too. He’s at least superhero-esque. Absolutely! My aunt took my cousin and me to see the original one when I was a little too young to see it and my cousin was WAY too young to see it, ha. Haha. Yeah, I think RoboCop was the first movie I can remember watching with any significant amount of violence in it and I was like in Kindergarten or younger when I saw it. I’m glad I did though because it’s easily one of the best satires ever made. I think that’s part of why Peter Weller was such a great choice for Batman in the new Dark Knight Returns film since both stories really capture that kind of bleakly humourous, semi-dystopian 1980s vibe.